Mill Lane Studio: Simple is often best! 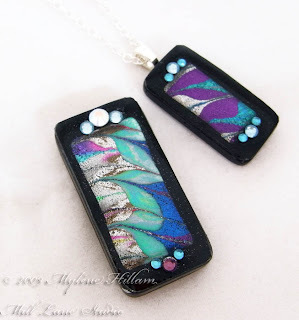 Take these striking pendants - Friendly Plastic strips marbled together and cut with cookie cutters. A very simple idea and lovely all on it's own. But when it's placed on a black resin base and topped up with clear resin, it just pops off the background. They don't need much else to finish them off..... just a few flat backed crystals and a silver bail and they're ready to thread on a silver chain and wear. I've used a Krafty Lady art mould (AM245 X4Lge 5 Dominoes) as the base for these pieces. They're nicely proportioned for my rectangular cutter set (Makins). When making these, begin at the bottom with the black and work your way up so that you can see what you're doing. Allow the black resin to cure before placing the Friendly Plastic onto it so that it doesn't sink into the resin and disappear! If you start with the clear resin in the base of the mould and work your way down to the black then you risk the possibility of the black resin working it's way underneath the front of the Friendly Plastic, as resin will always find the lowest point. Just take care not to overfill the mould when you top up with clear resin so that you don't have any major trimming to do. 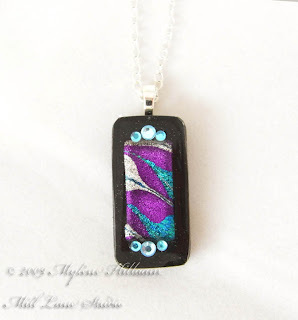 Once your pendant is cured, attach a fused glass bail with a little bit of Epoxy adhesive (Araldite) or resin, and once dry thread on a chain and wear your beautiful pendant.